Molluscs are a very diverse group, with at least 85,000 species named, and estimates of up to 200,000 species occurring worldwide. They also inhabit nearly all ecosystems. The best known classes of molluscs are the Gastropoda (snails and slugs), Bivalvia (clams, oysters, mussels and scallops) and Cephalopoda (squids, cuttlefishes, octopuses and nautiluses). Figure 1. Diagram of typical snail shell showing major features. Among the most interesting of the molluscs are the snails. They occur in both aquatic (marine and fresh-water) and terrestrial environments. Other snails are amphibious, moving freely between wet and dry habitats. A number of terrestrial snails occur in Florida, some indigenous (native) and others nonindigenous (not native). Most snails are either beneficial or harmless. For example, Florida is host to some attractive but harmless tree-dwelling snails that feed on algae, fungi, and lichens, including at least one that is threatened. However, a few snails may feed on economically important plants and become pests. The terrestrial species that can become plant pests are discussed below. Snails are best known for their shell (Fig. 1), which can appear in various forms but normally is coiled (helical). Unlike most animals, it is not obvious that snails display bilateral symmetry (the left and right halves of the animal are mirror images). In fact, the bodies of snails are mostly symmetrical, but their shells tend to be asymmetrical. This is due to the helical nature of the shell, which winds to the right (the shell opening is to the right when held spire upwards) most often, but to the left occasionally. The shape of the shell varies considerably. It may range from being quite conical, resulting from an elevated spire, to globose, which is almost spherical in form, to depressed or discoidal, which is nearly flat. The shell is secreted by a part of the body called the mantle, and the shell consists principally of calcium carbonate. Snails secrete an acidic material from the sole of their foot that dissolves calcium in the soil and allows uptake so the shell can be secreted. Calcium carbonate also is deposited in the shell of their eggs. Thus, lack of calcium can impede growth and increase mortality in snails. 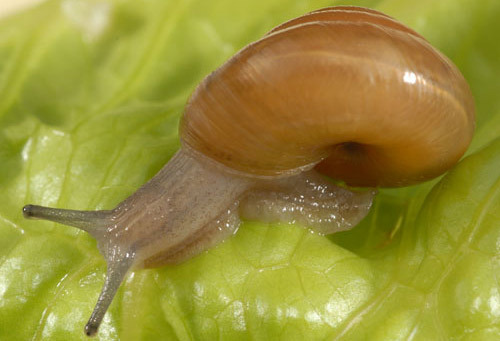 Slugs, which are snails with little or no shell, are less affected by calcium availability. The shape of the snail changes with maturity. With immature snails, the lower lip of the aperture seems to droop, extending well away from the whorls. As they mature, the aperture rounds out and eventually becomes more oval, with the bottom lip almost in line with the base of the shell (Fig. 2). For purposes of identification, adults normally are required. Figure 2. 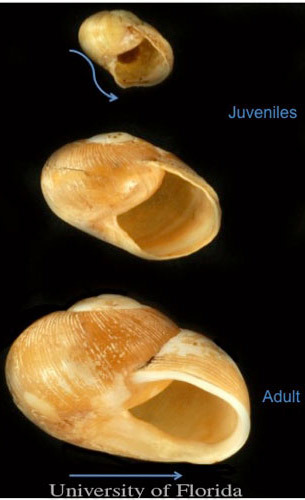 Photographs of young, intermediate, and mature Zachrysia snail shells showing change in shape as the snails mature. Photograph by Lyle Buss, University of Florida. Many marine snails have a retractable covering on the dorsal end (upper tail) of the foot which serves to close the shell opening (aperture), which is called an operculum. However, it is absent from nearly all terrestrial snails. Some terrestrial snails have a temporary operculum, however, and which is called the epiphragm. The epiphragm is basically a mucus secretion, but sometimes contains calcium carbonate for reinforcement, making it hard and durable. The purpose of this secretion it to seal the shell and prevent dehydration during periods of inactivity, including the winter or dry season. Among the more unusual features of snail biology is the mode of reproduction. Terrestrial snails are hermaphrodites, which means that they contain both male and female organs. Thus, snails may copulate and inseminate each other simultaneously, and even self-fertilization may occur. Cross-fertilization is thought to be more common, however, because for many snails the male reproductive system matures earlier than the female's. In some snails there is only a single act of copulation, whereas in others, mating can occur repeatedly. Mating requires high humidity, and often occurs following precipitation. Clusters of eggs are normally deposited in nest holes in the soil. The eggs often are white, and the shell contains calcium. Useful sources of information on terrestrial snail pests include Barker (2001, 2002) for general information, Hubricht (1985) for distribution, Pilsbry (1940) for identification, and the www.jaxshells.org Web site for images and regional information. Deliberately introduced to the Miami area from Cuba in the early 1900s, it now is the most abundant of the large terrestrial snails in southern Florida but can be found as far north as Tampa. It also is known from several of the islands in the Caribbean region and from Costa Rica. This snail has proved to be quite voracious, capable of consuming most plants it encounters. It attacks tropical fruit and citrus, most ornamental plants, and vegetable plants. It is readily transported with potted plants, so it is a quarantine issue. Figure 3. Cuban brown snail, Zachrysia provisoria (L. Pfeiffer, 1858), eggs and egg shells from which young snails have emerged. Photograph by Lyle Buss, University of Florida. Figure 4. 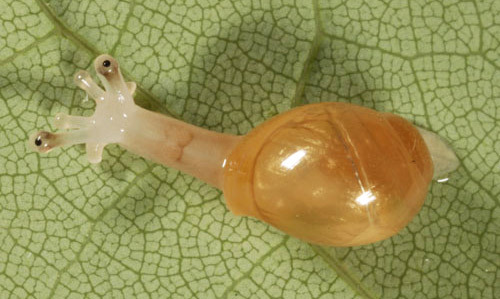 Newly hatched Cuban brown snail, Zachrysia provisoria (L. Pfeiffer, 1858). Photograph by Lyle Buss, University of Florida. Figure 5. 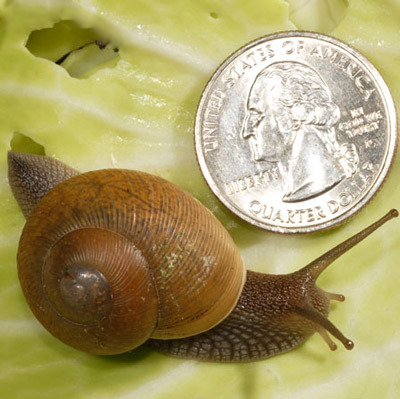 Dorsolateral view of Cuban brown snail, Zachrysia provisoria (L. Pfeiffer, 1858), with quarter shown for scale. Photograph by Lyle Buss, University of Florida. A closely related species from Cuba, Zachrysia trinitaria (Pfeiffer, 1858), was first reported from southern Florida in 2004, though it may have been present for many years (Robinson and Fields 2004). As yet, it is rare. It greatly resembles Z. provisoria but can be distinguished by its larger size (41–45 mm). Its potential to cause damage is unknown. Although it likely originated in eastern Asia, Bradybaena similaris has now spread thoughout the tropics and subtropics around the world. In the USA, it was first identified in New Orleans in 1939, but now is found in the Gulf Coast states from Florida to Texas, as well as in Puerto Rico and Hawaii. It is troublesome mostly in southern Florida as far north as Tampa, but because potted plants are regularly moved northward it can appear almost anywhere. Bradybaena similaris can damage crop plants, including citrus, longan, mango, and grape, but it is especially damaging to ornamental plants. Most flowers and foliage plants, as well as vegetable plants, can be attacked. Where it has successfully invaded it sometimes becomes the dominant snail in suburban and urban areas. Bradybaena similaris is a moderately sized snail, measuring about 12–16 mm in diameter at maturity, and 9–11 mm tall. The shell has 5–5.5 whorls. The umbilicus (cone-shaped depression at center of the whorls) is pronounced when viewed from below. The color is variable, often brownish, yellowish, or tan, and usually with a narrow brown stripe on the perimeter of the whorl. This latter character, though not appearing on all specimens, is rather diagnostic. The mouth of the shell is slightly flared, and edged in white. The ribs (ridges) are fine, not pronounced as in Zachrysia provisoria. Figure 6. Asian tramp snail, Bradybaena similaris (Férussac, 1821). 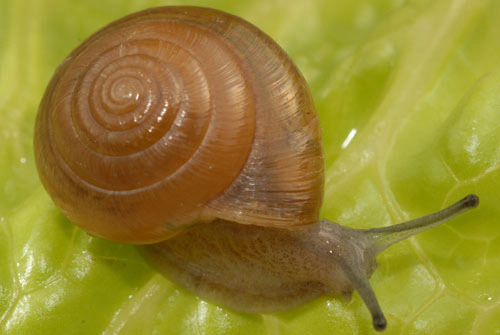 Note the brown stripe located centrally on the outer whorl; this character is usually present on these snails. Photograph by Lyle Buss, University of Florida. Figure 7. Asian tramp snail, Bradybaena similaris (Férussac, 1821), with dime shown for scale. Note that it is much smaller than Zachrysia sp. Photograph by Lyle Buss, University of Florida. 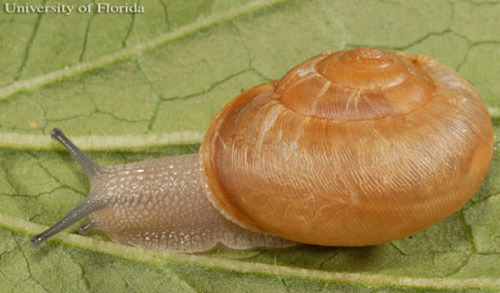 Pomacea paludosa (Say 1829) is indigenous to Florida, Cuba, and Hispaniola, and is called Florida applesnail. It does not feed on economically important plants, preferring small organisms such as algae and bacteria. 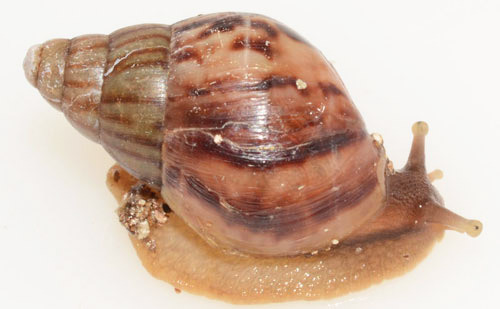 Pomacea maculata (Perry, 1810), the most common of the nonindigenous applesnails, is called island applesnail. It now occurs widely in Florida and also in Georgia and Texas. It also occurs in southern South America. Pomacea diffusa Blume 1957 is known as the spike-topped applesnail. It is now found in southern and central Florida, in Cuba, and in South America. Pomacea haustrum (Reeve, 1856), the titan applesnail, also is from South America. Although it has been established in Palm Beach County, Florida, for decades it does not appear to be spreading. The one species that Florida lacks, and which is undoubtedly the most serious plant pest in this group, is Pomacea canaliculata (Lamarck, 1822) or channeled applesnail. It occurs widely in South America and also now is found in Arizona and California. It is a serious pest of rice in Southeast Asia. Marisa cornuarietis is quite easy to distinguish from the Pomacea spp. Marisa has a planorpoid (flattened) shell form, and usually bears several dark spiral stripes on the whorls. 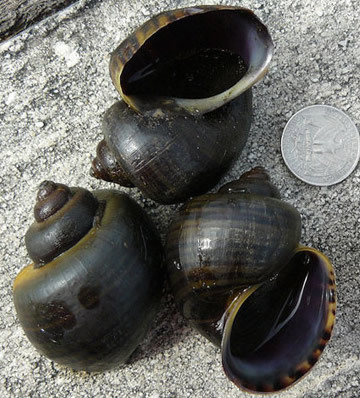 The only snail among the Pomacea applesnails in Florida that feeds on higher plants is Pomacea maculata. It feeds on rooted aquatic vegetation, so for most people it is not a concern. As noted previously, the real risk to economically important plants is from Pomacea caniculata, but it is not known from Florida, despite some reports to the contrary. Marisa similarly feeds on aquatic plants, but is quite omnivorous, and will feed on decaying vegetation and aquatic animals as well. Marisa cornuarietis has been introduced into some bodies of water for vegetation control. They will feed on water hyacinth, and perhaps hydrilla, and can replace other aquatic plant-feeding snails. In Puerto Rico, they are believed to replace Biomphalaria snails, which are intermediate host for the disease Schistosomiasis (Radke et al. 1961, Seaman and Porterfield 1964). 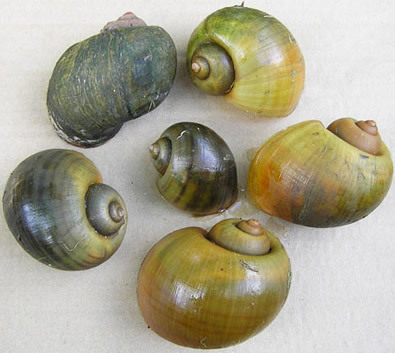 The shell color of the Pomacea snails ranges from yellow to green or brown, and may lack or possess stripes. The shell is globose and large, measuring about 40–60 mm in diameter and 40–75 mm in height. The shells have 5–6 whorls and possess an operculum (a hard covering of the shell opening). Eggs are deposited in clusters on emergent vegetation or structures. The Apple snails Web site at http://www.applesnail.net/ also provides useful information. 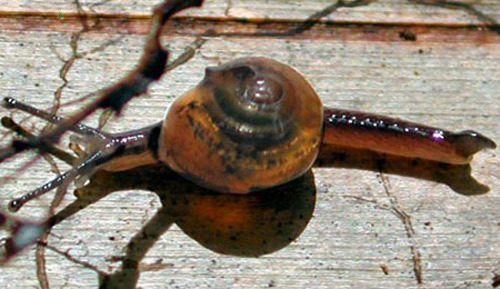 The shell of Marisa cornuarietis may be yellow, tan, brown, or brick red, and usually bears darker stripes. They are 35–50 mm in diameter. There are 3.5–4 whorls, and the aperture is slightly flared. A small operculum is present. The eggs are deposited in a gelatinous clutch below the surface of the water. Figure 8. The spike-topped applesnail, Pomacea diffusa Blume 1957. Photograph by Bill Frank, Jacksonville Shell Club. Figure 9. The island applesnail, Pomacea insularum (d'Orbigny, 1835). Photograph by Bill Frank, Jacksonville Shell Club. Figure 10. The giant ramshorn snail, Marisa cornuarietis (Linnaeus, 1758). Photograph by Bill Frank, Jacksonville Shell Club. Otala lactea is a native of the eastern Mediterranean (Canary Islands, Morocco, Portugal, Spain), but has been relocated to other areas of the world (Argentina, Australia, Bermuda, Cuba, USA), sometimes because it is edible. In the USA, it occurs in Arizona, California, Florida, Georgia, Mississippi, and Texas. In Florida, it has persisted in the Tampa area since 1931. 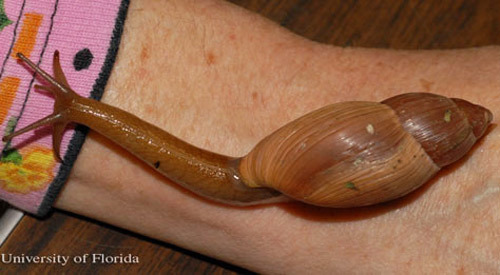 These plant-feeding snails cause only minor damage, and display little indication that they will spread, though they cause concern in some neighborhoods in the Tampa area. In California, which has a Mediterranean climate similar to its native range, it is viewed as a more serious pest. There, this species produced an average of 66 eggs per clutch, and two clutches per month, depositing them in loose soil. It is adapted to arid conditions, so it can aestivate on stones and shrubs until suitable conditions return. It secretes an epiphragm during such periods. Like most snails, activity increases after rainfall (Gammon 1943). Otala punctata occurs in almost the same areas of Europe, namely Spain, France, and now Italy and Malta. It, too, is edible and has been relocated to North America (California, Florida, Georgia) and South America (Argentina, Chile, Uruguay). In Florida, it is found only at Fernandina Beach (Amelia Island) and shows no sign of expanding is range. It feeds on some ornamental plants at this location, but is not a serious problem. The shell color of these snails is quite variable, ranging from milky white and nearly lacking pigmentation to quite dark brown, with pronounced stripes. The shell opening is flared, and the shell lacks an umbilicus (cone-shaped depression at center of the whorls). The shells of milk snails are about 28–39 mm wide and 18–24 mm high. There are 4–5 whorls, and the whorls bear only fine ridges. The milk snails can also be recognized by the presence of a strongly extended, thin rim or ridge at the lower lip (columella) of the milk snail's opening. In both species, the ridge may be dark brown to almost black. However, in Otala lactea the dark color extends along the rim of the opening to its most distant point from the center of the shell. In contrast, in Otala punctata the dark color of the rim tends to be more abbreviated. Also, in Otala lactea the rim or ridge (columella) of the shell opening is often elevated to form a blunt tooth; the tooth is lacking in Otala punctata. 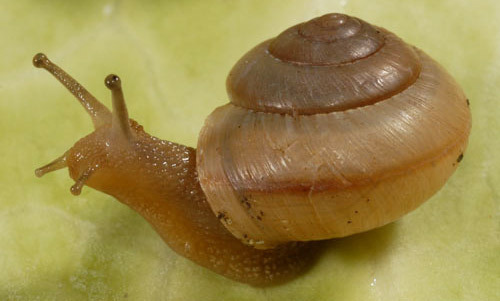 Superficially, the milk snails may resemble the brown garden snail, Cornu aspersum (Müller, 1774) (also called Helix aspersa or Cantareus aspersus) an important pest snail in California and a quarantine issue for Florida. However, the milk snails are relatively flattened or depressed, being only about 2/3 as high as wide, whereas brown garden snail is globose, almost as tall as wide. Figure 11. 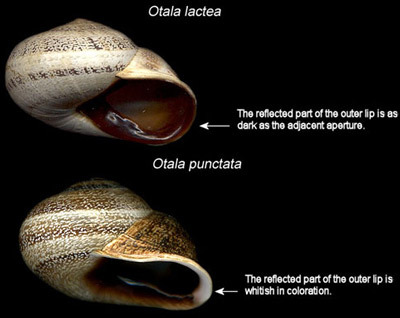 Comparison of Otala lactea (Müller, 1774) and Otala punctata (Müller, 1774). Photograph by Bill Frank, Jacksonville Shell Club. 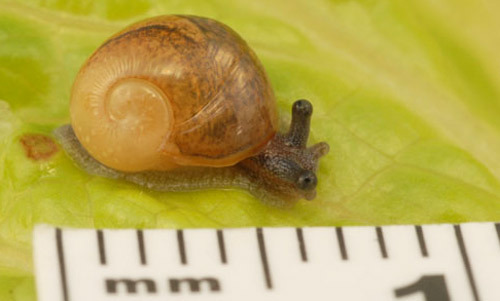 Originally described from Japan, this small snail is now found in other countries including Singapore, Thailand, Colombia, Costa Rica, Trinidad, Tobago, and probably elsewhere. In the USA, it is known from Hawaii and southern Florida. It is known mostly as a pest of orchids, but also feeds on Heliconia, Dracaena, avocado, and mango. In studies conducted in Costa Rica (Barrientos 1998, 2000), this species was most abundant where there was a deep layer of organic matter on the soil, abundant herbaceous vegetation, and abundant moisture. Snails matured and commenced egg deposition in about 42 days, and did not require cross-fertilization to reproduce. 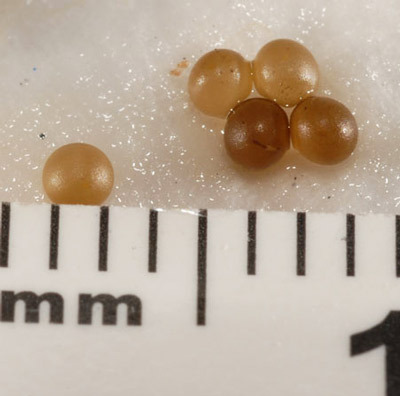 The eggs measured 5.12 mm in diameter and were deposited in small clusters of about three eggs in litter or shallow soil crevices. They could deposit an egg cluster nearly daily. Eggs absorbed moisture from the substrate and hatched in 10–14 days. Although widely distributed in Costa Rica, its occurrence was limited to areas with a mean annual temperature of 20–27.6°C. Figure 12. The jumping snail, Ovachlamys fulgens (Gude, 1900). Photograph by David Robinson, USDA, APHIS-PPQ. This indigenous species is found throughout peninsular Florida, and elsewhere in the southeastern USA, west to Texas. Outside of Florida, its occurrence usually is coastal. It inhabits soil, detritus, and dead wood, climbing onto vegetation and structures in and around gardens. 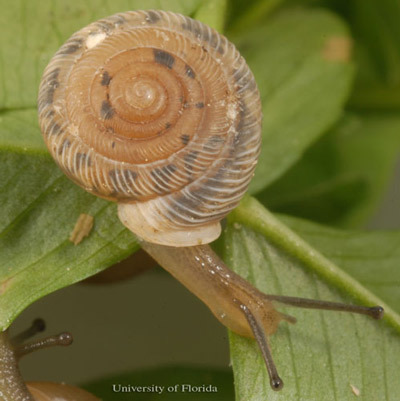 This commonly occurring snail will feed on plants, and is documented to inhibit establishment of legumes, particularly white clover and to a lesser degree red clover and alfalfa, in Florida (Kalmbacher et al. 1978). It has been introduced into Abu Dhabi, Dubai, Saudi Arabia and Qatar, probably along with turfgrass sod, and has become quite numerous there, though no damage is documented. The shell of Polygyra cereolus is usually about 8 mm in diameter, though it may range from 7–18 mm. It is 3–5 mm high. Its color is brownish orange. It has about 8 whorls (range 5–9), and very little elevation, so it is a rather flat shell. The whorls have been accurately described as coiled like a rope, and they are well marked with ridges or ribs, adding to the rope-like appearance. The whorl is flared at the opening (aperture) and the aperture has a pronounced tooth, causing the opening to be heart-shaped. The umbilicus is pronounced. Figure 13. Southern flatcoil, Polygyra cereolus (Mühlfeld, 1818). Photograph by Lyle Buss, University of Florida. Figure 14. Southern flatcoil, Polygyra cereolus (Mühlfeld, 1818), dorsal (left) and ventral (right) surfaces. Photograph by Lyle Buss, University of Florida. Figure 15. Feeding damage to white clover by the southern flatcoil, Polygyra cereolus (Mühlfeld, 1818). Photograph by Lyle Buss, University of Florida. This indigenous species occurs broadly in the eastern USA from New England to Michigan and south to Florida and Texas. It occurs in many habitats, including woods, meadows, marshes, roadsides, and gardens, and is often found hiding in leaf litter. It is considered to be mycophagous, but it will also feed on foliage of wild and garden plants if necessary. Like many snails, it will selectively feed on senescing or unhealthy plant material. It deposits its eggs in shallow holes in the soil, normally in clusters of 20–70 eggs. It has at least a two-year life cycle in more northern areas, but in Florida its biology is unknown. It can produce a thin epiphragm. 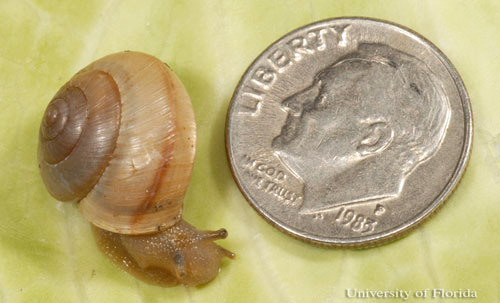 This is a moderately sized snail, measuring 18–25 mm in diameter and 11–18 mm high. It is globose in form, finely ribbed, and brown or yellowish brown in color. The opening (aperture) is slightly flared, and often lighter in color, especially in fresh specimens. The aperture may have a single blunt tooth, though this is often absent. It has a narrow umbilicus, which is normally half covered and sometimes difficult to detect (Pilsbry 1940). Figure 16. The white-lipped globe, Mesodon thyroidus (Say, 1816), lateral view. Photograph by Lyle Buss, University of Florida. Figure 17. The white-lipped globe, Mesodon thyroidus (Say, 1816), dorsal view. Photograph by Lyle Buss, University of Florida. This is one of three dome snails found in the northern portion of Florida. The other two are Ventridens cerinoideus (Anthony 1865), which is known as wax dome, and Ventridens volusiae (Pilsbry, 1900), which is known as Seminole dome. Ventridens demissus and Ventridens cerinoideus occur widely in eastern North America, but are restricted to the northern counties of Florida, south to Alachua County. Ventridens volusiae, on the other hand, occurs only in Florida, and is found in both the northern and central regions of the peninsula. The dome snails are similar in appearance and habitat. Their biology is largely unknown. 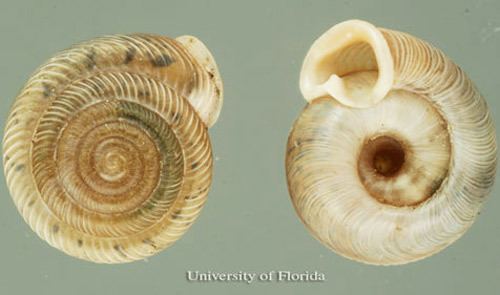 The Florida dome snails are small, measuring 5–10 mm in diameter, with a height of 5–7 mm. They display 6–7 whorls. The ribs on the whorls are fine. The shell is yellow-brown in color, and somewhat transparent. The shell has a narrow umbilicus. The opening (aperture) of the shell is only slightly flared. A large, irregular whitish area is present before the margin of the aperture when the shell is viewed from below. Figure 18. The perforate dome, Ventridens demissus (A. Binney, 1843), dorsal view. Photograph by Lyle Buss, University of Florida. Figure 19. The perforate dome, Ventridens demissus (A. Binney, 1843), dorsal view. Photograph by Lyle Buss, University of Florida. Figure 20. 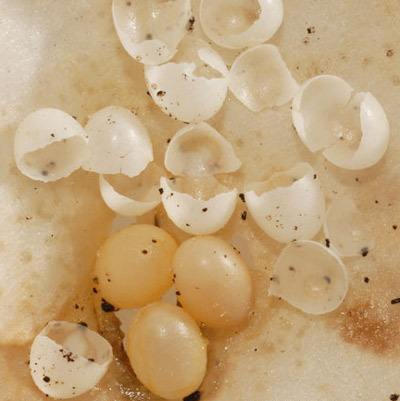 Eggs of the perforate dome, Ventridens demissus (A. Binney, 1843). Photograph by Lyle Buss, University of Florida. Giant African land snail also has the potential to transmit disease-causing organisms to plants and animals, including humans. It can serve as an intermediate host for rat lungworm, which can cause meningoencephalitis in humans. It also carries a gram-negative bacterium, Aeromonas hydrophila, causing several disease symptoms in people, especially those with compromised immune systems. Thus, should you encounter the giant African land snail, it should be handled with gloves. The giant African land snail grows to a large size. At maturity, it can attain a length of nearly 20 cm and a diameter of 13 cm. It is conical in shape, tapering to a distinct point at one end, but rounded at the other (Fig. 1). 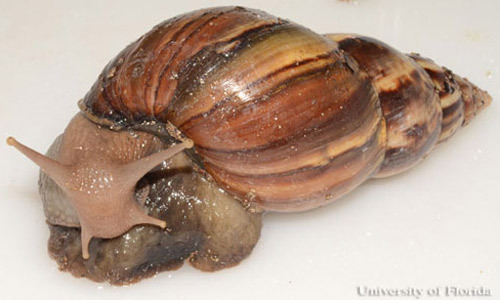 Although varied in appearance, this snail typically is light brown, with dark brown stripes. 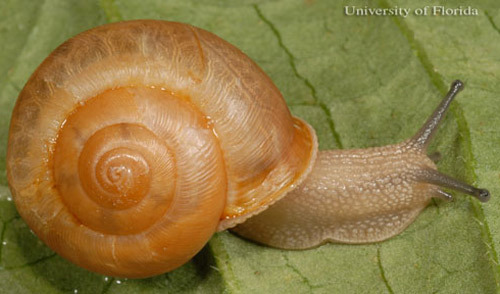 The large size and conical shape could cause it to be confused with a predatory snail, the rosy wolf snail, Euglandina rosea, but rosy wolf snail lacks the dark brown stripes and does not become as large (about 7.5 cm). Figure 21. Mature giant African land snail, Achatina (Lissachatina) fulica Férussac, 1821), lateral view. Photograph by Lyle Buss, University of Florida. Figure 22. 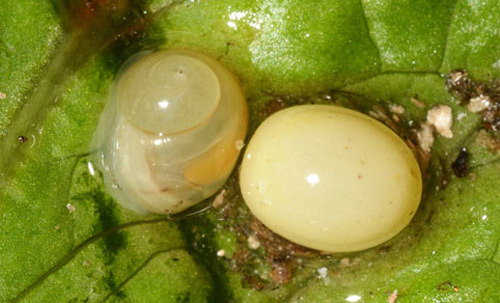 Egg (right) and newly hatched snail (left) of the giant African land snail, Achatina (Lissachatina) fulica Férussac, 1821). Photograph by Lyle Buss, University of Florida. Figure 23. Young giant African land snail, Achatina (Lissachatina) fulica Férussac, 1821). Photograph by Lyle Buss, University of Florida. Snails (and slugs) are most often managed with chemicals called molluscides, but there are several other management options in addition to application of chemical pesticides. Some of these options are outlined below. Barriers are also useful for minimizing damage by snails and slugs (Hata et al. 1997). Copper foil and screening is believed to react with mollusc slime to create an electrical current that deters them from crossing the barrier. The legs of greenhouse benches or the trunks of trees, for example, can be ringed with copper strips to deter these animals from crossing. Copper foil designed specifically for deterring mollusk movement is available commercially from garden supply centers and catalogs. Although expensive to implement, copper can be used to ring entire gardens to prevent invasion by molluscs. The copper strip will oxidize with time, however, becoming less effective. Similarly, diatomaceous earth can be sprinkled around a garden or planting bed to exclude molluscs, as they dislike crawling over this abrasive particulate material. As is the case with a copper barrier, however, this does nothing to suppress any that are already present, and the diatomaceous earth is easily disturbed by rainfall and irrigation, so it works best in arid environments. Biological control. Predatory snails such as the rosy wolf snail, Euglandina rosea (Férussac, 1821) (Figs. 24-28), readily attack other snails. Euglandina rosea is native to the southeastern U.S., and is quite common in woodlands and gardens in Florida. It has been relocated to other parts of the world, including Hawaii, India and many islands in the Pacific region in an attempt to control invasive snails such as giant African land snail, Achatina fulica (Férussac, 1821). It has been used to provide partial control of giant African snail, but it has been quite disruptive to native snail populations, so its use is discouraged outside its natural range (Barker 2004). Figure 24. The rosy wolf snail, Euglandina rosea (Férussac, 1821), lateral view. Photograph by Lyle Buss, University of Florida. Figure 25. 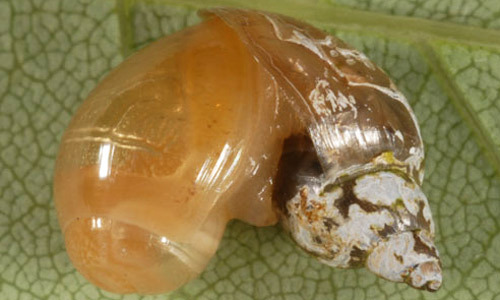 The rosy wolf snail, Euglandina rosea (Férussac, 1821), fully extended. Photograph by Lyle Buss, University of Florida. Figure 26. Newly hatched rosy wolf snail, Euglandina rosea (Férussac, 1821). Photograph by Lyle Buss, University of Florida. Figure 27. A young rosy wolf snail, Euglandina rosea (Férussac, 1821), feeding on another snail. Photograph by Lyle Buss, University of Florida. Figure 28. 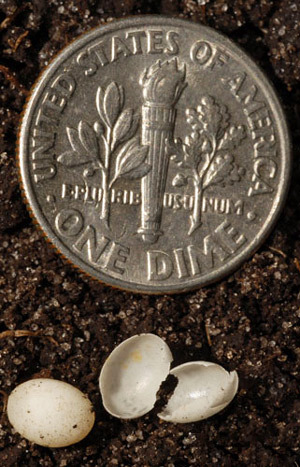 Eggs of the rosy wolf snail, Euglandina rosea (Férussac, 1821), with dime shown for scale. Photograph by Lyle Buss, University of Florida. Chemical control. Many formulations of molluscicide are available for purchase, but nearly all are bait products that contain toxicants. They may kill by ingestion of the bait, or by contact. None are completely effective because molluscs sometimes learn to avoid toxicants or may detoxify pesticides, recovering from sublethal poisoning. Often they are paralyzed and do not die immediately, but eventually succumb, especially in hot, dry weather. It is good practice to apply baits after a site is watered or irrigated, as this stimulates mollusc activity, increasing the likelihood that baits will be eaten. However, do not water immediately after application of baits. Baits can be applied broadcast, or around gardens containing susceptible plants. It is best to scatter the bait material, as this will decrease the probability that pets or vertebrate wildlife will find and eat the toxic bait and become sick or perish. Metaldehyde-containing baits have long been useful, and remain available (Meredith 2003). Although effective, metaldehyde-containing formulations are quite toxic to pets and wildlife, so care must be exercised if this toxicant is applied. Also, it is a good idea to avoid contamination of edible produce with metaldehyde-containing bait. There are alternatives to metaldehyde. Some molluscicide-containing products include carbamate pesticides (alone or in combination with metaldehyde), as these also may be toxic to molluscs. Newer mollusc baits may contain an alternative toxicant: iron phosphate. Iron phosphate is normally thought of as a fertilizer. Iron phosphate is much safer than metaldehyde and/or carbamates for use around pets and vertebrate wildlife, and also is effective (Speiser and Kistler 2002). Other bait formulations contain boric acid as a toxicant; while also safer than metaldehyde, boric acid seems to be much less effective than iron phosphate (Capinera, unpublished). Regardless of the toxicant, baits should be scattered thinly in and around vegetation, so as to make it unlikely that pets or wildlife will ingest too much of the bait. Barrientos Z. 1998. Life history of the terrestrial snail Ovachlamys fulgens (Stylommatophora: Helicarionidae) under laboratory conditions. Revista de Biologia Tropical 46: 369-384. Barrientos Z. 2000. Population dynamics and spatial distribution of the terrestrial snail Ovachlamys fulgens (Stylommatophora: Helicarionidae) in a tropical environment. Revista de Biologia Tropical 48: 71-87. Blinn WC. 1963. Ecology of the land snails Mesodon thyroidus and Allogona profunda. Ecology 44: 498-505. Carvalho CM, Bessa ECA, D'Ávila S. 2008. Life history strategy of Bradybaena similaris (Fèrussac, 1821) (Mollusca, Pulmonata, Bradybaenidae) Molluscan Research 28: 171-174. Cowie RH, Dillon Jr. RT, Robinson DG, Smith JW. 2009. Alien non-marine snails and slugs of priority quarantine importance in the United States: a preliminary risk assessment. American Malacological Bulletin 27: 113-132. Gamon,ET. 1943. Helicid snails in California. State of California Department of Agriculture Bulletin 32: 173-187. Hata TY, Hara AH, Hu BK-S. 1997. Molluscicides and mechanical barriers against slugs, Vaginula plebeia Fischer and Veronicella cubensis (Pfeiffer (Stylommatophora: Veronicellidae). Crop Protection 16: 501-506. Meredith RH. 2003. Slug pellets - risks and benefits in perspective. Pages 235-242 In Dussart GBJ, (editor). Slugs and Snails: Agricultural, Veterinary and Environmental Perspectives. BCPC Symposium Proceedings Series 80. BCPC, Canterbury, U.K.
Pilsbry HA. 1928. 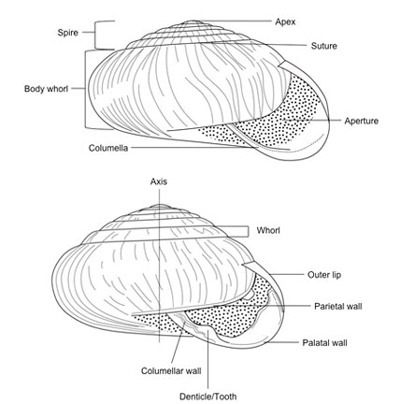 Studies on West Indian mollusks: the genus Zachrysia. Proceedings of the Academy of Natural Sciences of Philadelphia 80: 581-606. Radke MG, Ritchie LS, Ferguson FF. 1961. Demonstrated control of Australorbis glabratus by Marisa cornuarietis under field conditions in Puerto Rico. American Journal of Tropical Medicine and Hygiene 10: 370-373. Rawlings TA, Hayes KA, Cowie RH, Collins TM. 2007. The identity, distribution, and impacts of non-native apple snails in the continental United States. BMC Evolutionary Biology (Supplement 2) Vol. 7: 97-110. Robinson DG, Fields A. 2004. 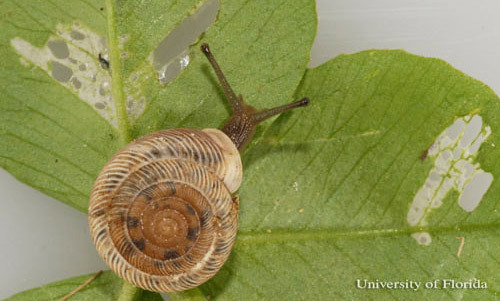 The Cuban land snail Zachrysia: The emerging awareness of an important snail pest in the Caribbean basin. In Leal JH, Grimm E, Yorgey C, (editors). Program and Abstracts of the 70th Annual Meeting, American Malacological Society, Sanibel Island, Florida, 30 July - 4 August 2004. Bailey-Matthews Shell Museum, Sanibel, Florida. p. 73. Seaman DE, Porterfield WA. 1964. Control of aquatic weeds by the snail Marisa cornuarietis. Weeds 12: 87-92. Speiser B, Kistler C. 2002. Field tests with a molluscicide containing iron phosphate. Crop Protection 21: 389-394. Publication Date: July 2011. Latest revision: July 2014.